Q: Can anyone order from Napa Glove & Safety, Inc.? A: In an effort to protect our distributors and dealers, we will not sell one or two pairs of gloves, boots, etc., to "end users". We will ship safety products to companies when we feel it will not present a problem to any of our current distributors. Our warehouse is open to the public. 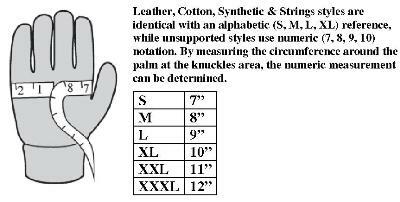 Q: How do I determine what size glove to order? Q: What if I am an "end user" and want to purchase just a couple of your products? A: Please feel free to contact us and we will direct you to one of our current distributors or dealers. A: Click on the contact button above and fill out the form or feel free to call us directly at 800-4-GLOVES, (800) 445-6837. Q: Can I place an order directly from this website? A: This website is not designed with a "shopping cart". You may, however, submit a purchase order that we will process immediately. Q: Why are no prices listed on your website? A: Due to the volitility in raw material costs, prices can fluctuate. Please call or submit a request for current pricing. A: Our office is open from 7:30 a.m. to 4:30 p.m. Pacific Time, Monday thru Friday. Our warehouse is open to the public from 7:30 a.m. to 4:00 p.m. Pacific Time, Monday thru Friday.